As a long, hot Saskatchewan summer dawns, Darby Swank’s life is forever changed when she finds her beloved aunt floating dead in a lake. All at once, her blinders are lifted and she sees the country lifestyle she’s always known in a whole new way, with hidden pain and anguish lurking behind familiar faces, and violence forever threatening to burst forth, like brushfire smouldering and dormant under the muskeg. With her first novel, Lisa Guenther lays bare familial bonds, secret histories and the healing potential of art. 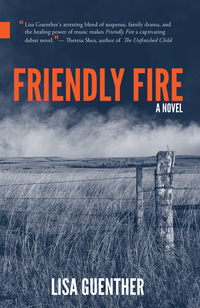 Friendly Fire recalls the work of Ann-Marie MacDonald and Lynn Coady as it eviscerates small-town platitudes and brings important issues to light. Lisa Guenther is a writer and agricultural journalist based in Livelong, Saskatchewan. Her writing has appeared in Grainews and Country Guide, and she is the sitting president of the Canadian Farm Writers’ Association. Friendly Fire is her first novel.